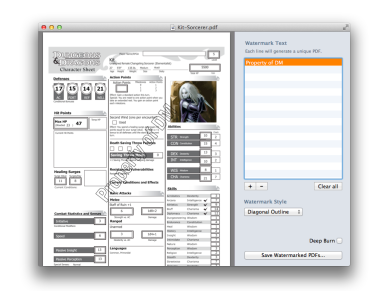 Bronson Watermarker (Mac App Store link) fills a small—but vital—niche for those who need to create watermarked PDFs and images. The app is simply designed by the team at Quote-Unquote Apps, opening with a single dialog that asks you to drag and drop an image or PDF for watermarking. Once you do so, a two-pane window opens with a preview of the file on the left and controls for watermarking on the right. You can create multiple text watermarks from this single file: The app allows you to add multiple text watermarks, and when you click “Save,” a separate PDF will be generated for each one. You can’t create image watermarks, unfortunately, nor can you change the font of the watermarked text; there are several text styles available, however: center, triple, diagonal, diagonal outline, lower right, and header. Diagonals can only go lower-left to upper-right, and there’s no option to flip them. If you want to make sure someone can’t strip the watermark from your PDF, you can use the app’s Deep Burn feature, which turns your exported PDF pages into images. When you watermark an image, you also have the opportunity to resize its dimensions and apply a line burn (a single light diagonal line). 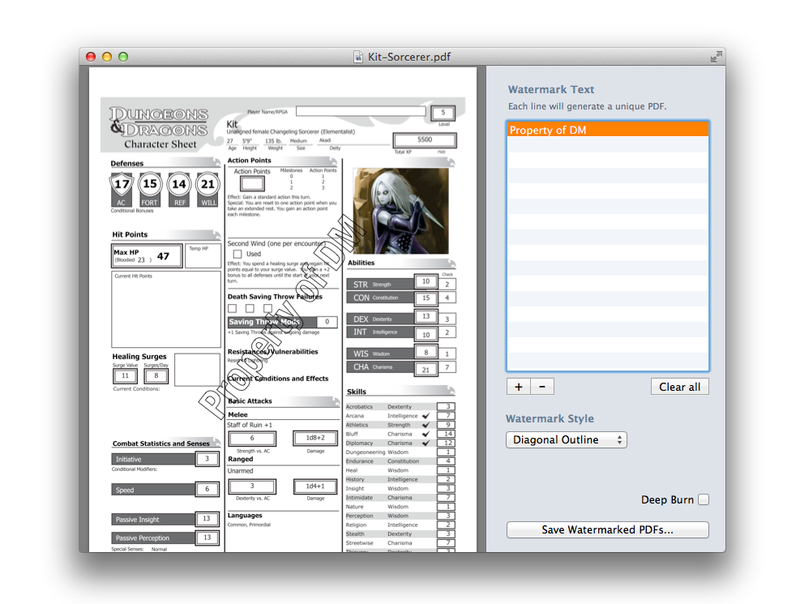 For screenwriters, publishers, and anyone who needs to keep their images or PDFs branded, Bronson Watermarker is a fantastic, easy-to-use utility.